I’ve been on the lookout for a quick and simple set of fantasy skirmish rules to use with my 25mm figures, I’ve heard many good things about A Song of Blades and Glory so I took the plunge and here is my first game. The rule are published by Ganesha Games. My ultimate goal is to have a skirmish set that captures the brutal nature of RuneQuest with the style and mythic feel of Glorantha. I opted for the Advanced edition as it promised more detailed magic and as Glorantha is a magic rich world I felt it needed that extra lift. The Advanced set also has Reactions which offer more dynamic play. hile the game is points based, the author stress that these are just guidelines and not intended for ‘power play’ , scenario and campaign based games are what’s recommend. An average game is 400 points which gets you between 5-8 minis on the board. Trollkins for exams cost about 20 each, while a Rune Lord could set you back 125 plus. 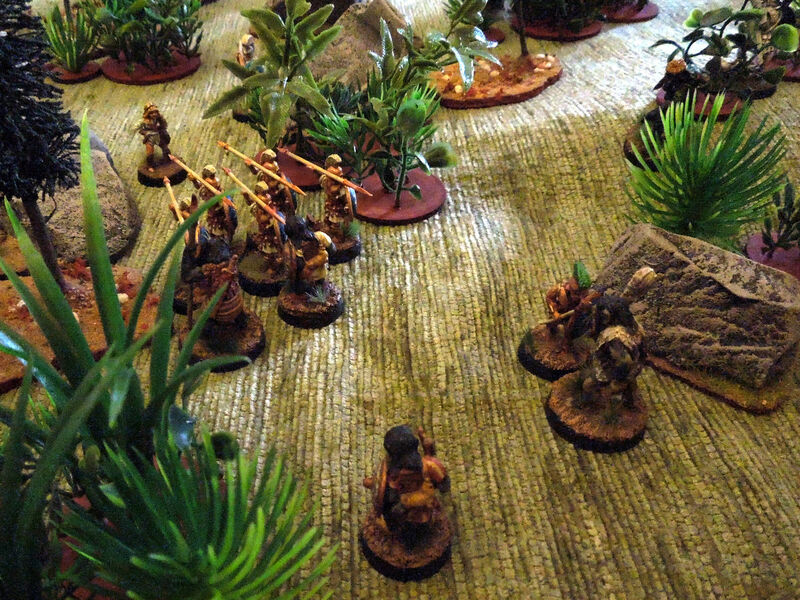 For my first game I went for a party of Sun Dome templars v’s Trolls. For my 400 Lunars I was able to get for the Sun Dome: 1 hero, 1 healer, 5 hoplite’s and a peltast. The Trolls had 1 Mistress Troll, 1 dark troll shaman, a great troll. 2 dark trolls, a cave troll and 4 trollkin. At it’s core ASOBH is very simple. Each figure has two abilities, Quality and Combat. Combat is how good they are at fighting and shooting (the higher the better) and Quality is everything else (the lower the better). Your average grunt has Q4 and C2, which means that they need to roll 4’s or better to do stuff, and the get a +2 to their combat. The game uses d6’s for everything. What makes your figures special is Traits, which can be anything from Spells, crossbows, magic armour, flight, cowardly, huge etc. the list is very long and covers all the standard RPG tropes. Adding Traits effects the cost of the model and makes them what they are. Some traits, such as Spell Casting, are classed as Personality Traits and make that model a Personality. You can’t spend more than 50% of your total on Personalities. 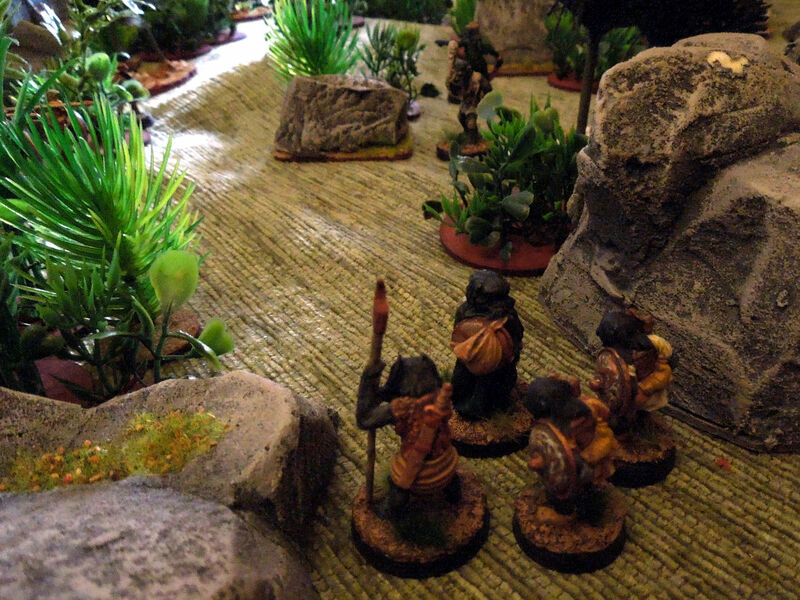 The game uses a very simple range system comprising of three lengths: short (75mm), medium (120mm) and long (180mm). Most models have a move of medium; spell, missile and other effects will have their range expressed as x long or x medium. Measuring sticks are recommend to keep it simple. Finally Activation. This is the real gem of game. It keeps both players engaged regardless of whose our it is and lends itself well to solo play. Basically in your turn you select a figure and must roll equal to higher their Quality score to Activate on a d6. The fun part is that you can chose to roll 1, 2 or 3 dice, each success allows 1 action. But each failure come at a cost, for each filed activation your opponent can elect to pick up the failed dice and attempt to React with one of their figures. Also with two or more failures the opponent can chose to end the turn and take the initiative and deny his opponent the opportunity to activate the balance of his war band. This means that you are never sure of the order of events and models may or may not activate which keeps the whole game fluid and engaging for both sides. The AAR For this game I had a very simple plot. 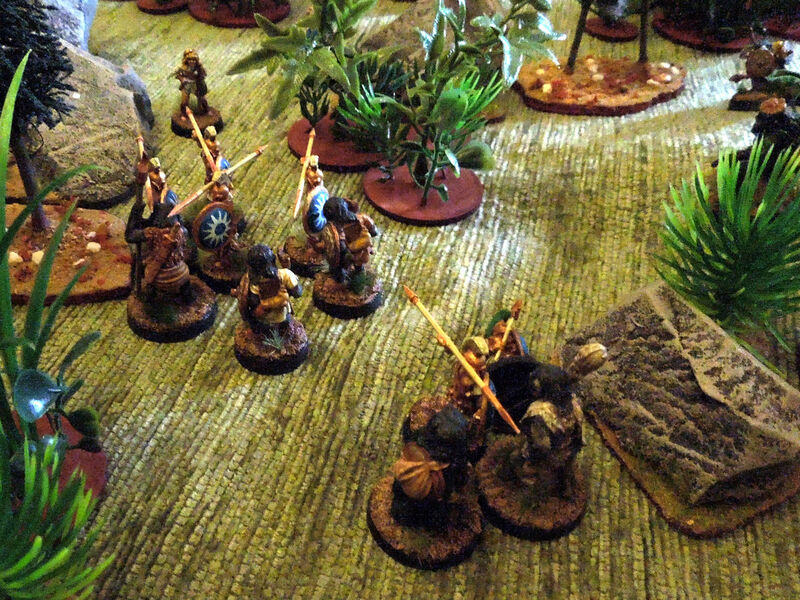 The Templars were looking for a lost shrine to a fallen hero (the statue in the middle of the table). The shrine happen to be in troll territory and they don’t take kindly to uninvited guests. I set the table and diced randomly from which side they entered. Models outside of 2x long from an enemy get one free Move activation each turn, however I wanted to see how the Activation system worked so diced from the beginning, this also give you chance to do more. 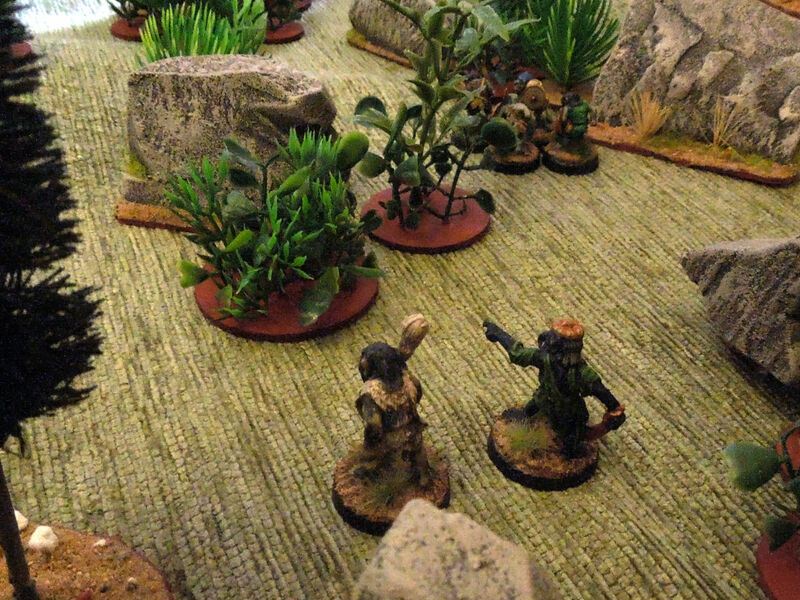 The trolls were first up and Mistress Troll orders her gang of trollkin on a wide flanking manoeuvre, while she and her dim-witted cave troll head for the shrine. My next attempt to activate the troll shaman resulted in a double fail. The troll turns ends. On the far side of the board the templars keep a tight formation moving ahead en-masse. The peltast and healer threading more carefully. Both leaders possess the Leader Trait which not only provides Activation and Morale bonuses within range but also allows for Group Activation of up to five figures at once. This is very useful has you can roll just once for multiple figures. Back to the troll and again the troll shaman seems hesitant to advance, so the mistress sends her pet cave troll to ‘inspire’ loyalty. 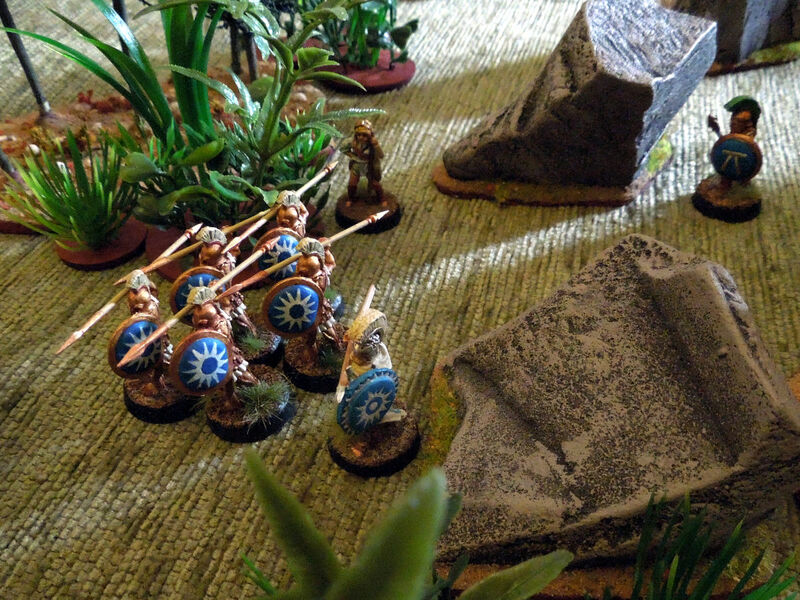 Meanwhile the hoplites form a strong defensive line (they possess javelins as a missile weapon and long spears which allow for the second rank to also engage in melee). The great troll is first to charge the Sun Dome phalanx and even with his poleaxe is unable to break the line. The two dark trolls follow-up but still the line holds. 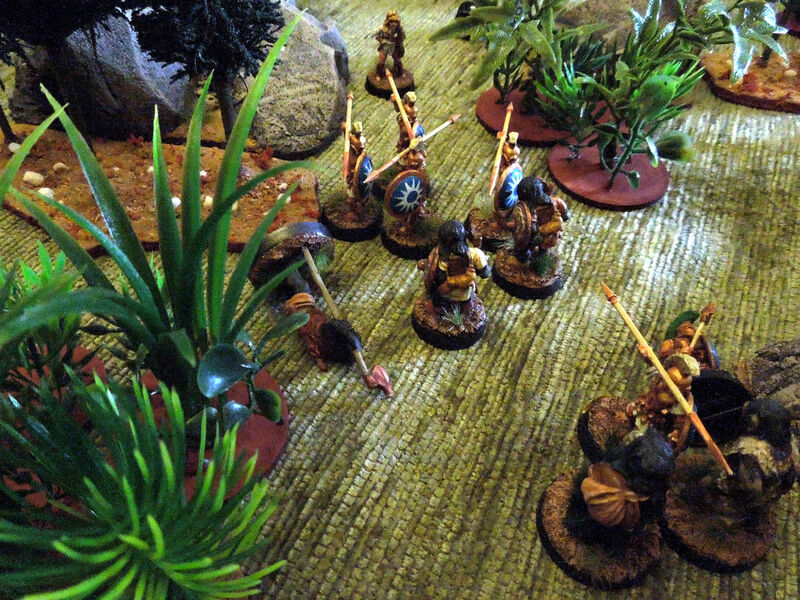 As the cave troll lumbers into view the peltast rushes forward to keep it out of the general melee, he’s assisted by one of the hoplites who in turn is engaged by the shaman. 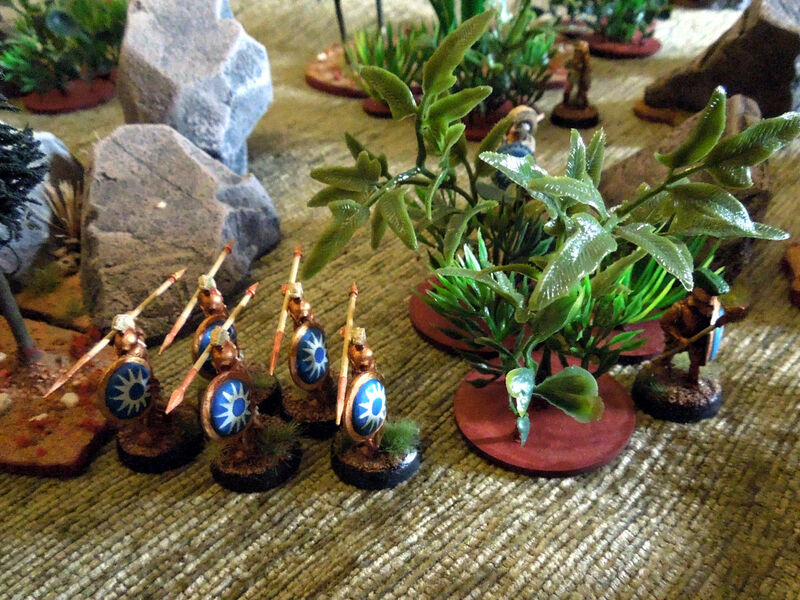 The peltast is first to fall as the hoplite line wavers. At this point the templars realise their poor choice of position. Their own lines occlude lines of sight, their flank is exposed. From her elevated central position the Mistress troll commands the battle. Summoning the power of Darkness she begins challenging the very courage of the Sun Dome warriors. The great troll falls and the hearts of the sun worshippers holds true. Perhaps they will get win the day. But as it is often brightest just before night falls the power of darkness ends the day. 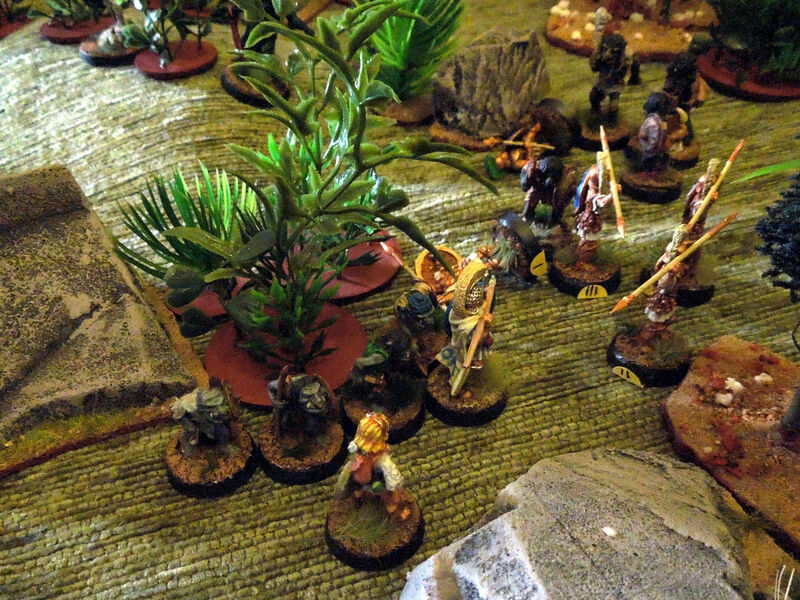 The trollkin burst from the undergrowth. A well aimed sling stone and the healer is knocked senseless. The others overwhelm the leader, bludgeoning him unconscious. With a dark shadow already in their minds the remaining templars flee. An astounding victory for the trolls. Only one casualty, which by the campaign rule may still survive. As for the templars, only two made it off table. No doubt the trolls can secure a substantial ransom from their captives. When a rule set exposes a poor position for what it is, something must be working. While on paper ASOBH seems overly simple it has just enough crunch to make it work. 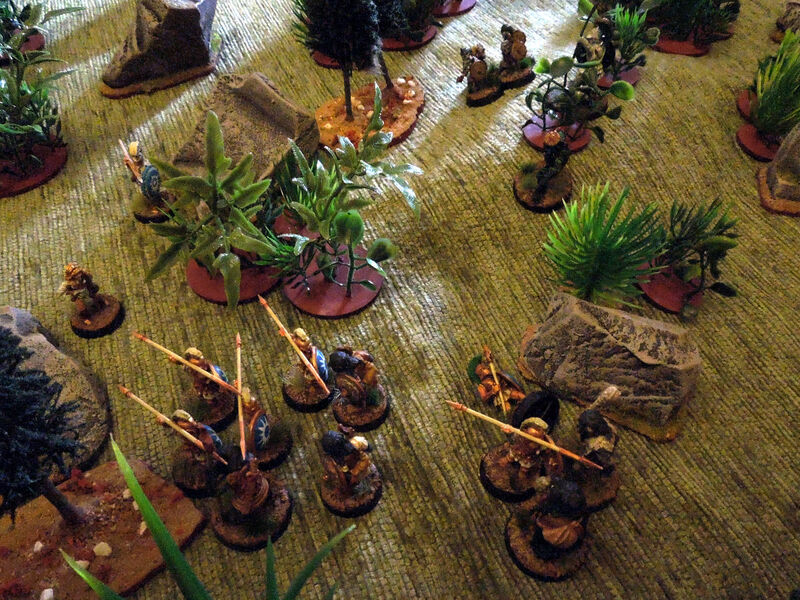 For example outnumbering your opponent lowers his Combat skill which not only makes is easier to win but increases your chance to double or triple the opponents total - required to remove a model from play. The game is full of these ‘simple’ mechanics that really make the game. Magic works very much the same way as all other Traits, with most spells being ‘stackable’ for increased power and/or range, very reminiscent of RuneQuest, as as with all actions you need to roll dice. The mistress troll’s first attempt to cast Aura of Fear only resulted in 1 success, which wasn’t enough to reach her target. A second attempt was needed the following turn. A 400 point game like this would play out in less than an hour once familiar with the rules which means that you could mange 2 or 3 games in a night. These could be linked for some really nice campaign style play. All in all a tremendous game and one I’ll be returning to very soon.